if you live in new york, you don’t go to the top of the empire state building. too touristy. if you are from chicago, you don’t visit the millenium bean, at least not on purpose. if you’re a resident of los angeles, you don’t go climbing the hollywood sign–although partly, that’s because there’ll be military helicopters jumping on you. in huntsville, which i will visit on august 21-22, i’m sure nobody ever goes to the u.s. space and rocket center. but the wheeler family, now they take advantage of every bit of excitement they can find in their community. they live large. i first met sheila wheeler (f2fb #187) when she worked at the community house in winnetka and later, i met lane wheeler (f2fb #188) when he was in the play “the sound of music” with my son eastman. like many facebook friends, lane’s work as an actor supports his true love–insurance. lane and sheila wheeler share a love in their life–star. star wheeler is ten years old and for her, the wheelers will do anything. including the renaissance faire in bristol, wisconsin. i drove up on saturday to meet them, using my spiffy new guy, jack the garmin gps. 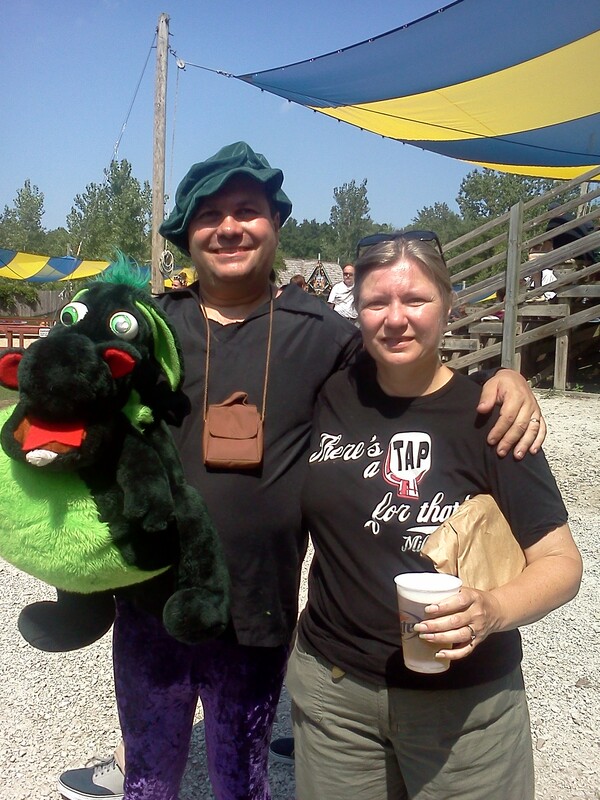 sheila and lane wheeler--lane is holding his service dragon! lane is the guy who sends the best holiday emails–it sort of doesn’t feel like any particular holiday has meaning until i get one from him. so, saturday was the feast of the Transfiguration of the Lord but since Lane didn’t send me an email i sort of ignored the holiday. lane was in costume (as was their daughter star) and sheila was dressed for comfort. i’ve been invited to decorate the wheeler home for halloween and their house has been featured in several seasonal news stories. when they go to the renaissance faire, they get there when the gates open and stay until they are shooed out the gates with fireflies to guide them to their car. they are a jump feet first people. i am not like them, although i wish i was. i drove up separately because i was worried that if i had to leave, if i felt too overwhelmed, i’d embarrass them. i wanted to make sure i had an escape plan. i really don’t like being guided into my parking space by a dude with a neon yellow flag because it usually means getting out is going to be hellacious. the people startled me. some wore t-shirts and baseball caps while others were in full throttle elizabethan garb and they spouted off like they were straight out of the sixteenth century. although the sixteenth century didn’t have miller lite on tap and port-a-potties. there were booths selling period costume, tarot readings, jewelry, and souvenirs. i ended up buying a black leather skirt that i regret now, but a lot less than i would have regretted buying a full length elizabethan gown. . . . all this stuff looked so NORMAL. the wheelers are the best guides into another world, in this case a really weird wacky world in a wisconsin that purports to be from another time. they are so laid back that after a while i forgot that i was far away from home and my car was stuck in a muddy field with five thousand other cars blocking its egress. i tarried too long. but, as i left, i slipped a little cash to star and told her to pick out a piece of jewelry to remember the day. i woke up this morning and amongst my emails was a thank you note. star had picked out a necklace for herself. she signed her note “star and the wacky wheelers” – me, i think of the wheelers as WONDERFUL!!! This entry was posted on Monday, August 8th, 2011 at 12:55 am	and posted in Uncategorized. You can follow any responses to this entry through the RSS 2.0 feed.